Every Friday, we bring you Offal of the Week: an up-close and personal look at one of the less-familiar parts of the animal. Delivered fresh by Ryan Adams of the blog Nose to Tail at Home, we highlight a different cut of meat that you've always wanted to make, but were afraid to ask your butcher for. This week: Trotters. Whether you know it or not, you have almost certainly enjoyed the wonderful abilities of pig feet, also known as trotters. Many chefs consider trotters their secret ingredient — these assemblages of skin, bones, fat and connective tissue are like sticks of dynamite, a small package with a huge amount of flavor. For that reason alone, it's time to seriously reconsider trying trotters, as they are highly regarded by those in the know. I've been known to call trotters the culinary equivalent of a Swiss Army Knife, and I stand by that: they can be prepared and utilized on so many ways that I don't have the room here to list them all. While trotters do lack significant amounts of meat, they do sport a mellow porky flavor that they'll willingly lend to whatever you cook them in or with. Even better, their extraordinary quantities of fat and gelatin assures that any dish they are used in will have that lip-sticking quality I sang praises about earlier when talking about pig tails. The amazing versatility of trotters means they can be deep fried, grilled, roasted, poached, or braised will excellent results. After a long braise the skin can be removed from the bones, pressed together, breaded and fried, or the bones can be removed and the skin stuffed with delicious fillings. 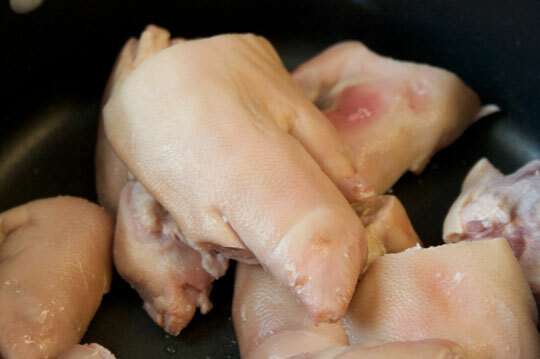 More commonly in contemporary cooking, trotters can be added to stock or sauces for extra flavor and body, and that certain porky je ne sais quoi. Speaking of the French, they have long known about trotters unique abilities. 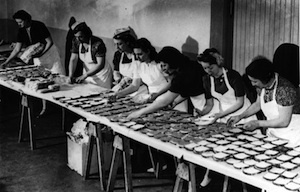 The foot of the pig has been a staple ingredient in cuisine for some time, with the rest of the world catching on to the good idea only fairly recently. Notable in spreading the gospel of the trotter has been London super-chef Pierre Koffman, whose signature dish is a braised trotter stuffed with sweetbreads, morels and other goodies. Marco Pierre White was so enamored with Koffman's trotter recipe that he included it on his menu at his restaurant Harveys, calling it at the time "the most amazing main course" he'd ever eaten in his life. If you're looking for trotters, your best bet is — surprise, surprise — your friendly neighborhood butcher, who will definitely have trotters on hand, though they might be hidden in the back. Asian markets will also often be stocked with trotters, and if they have a butcher counter you can often even specify how long you want each trotter to be. A good trotter should be neither sopping wet or bone dry, you're looking for a slightly moist, smooth, pink and plump piece of meat. They're fairly cheap and can last for ages when properly stored, so buy a few dozen and freeze the rest to use in future dishes — if you're creative, you can incorporate them into almost everything you prepare. When you're buying small quantities and keeping them in the fridge, use them by the second day.